We Have Nut-Free & Gluten-Free Chanukah Chocolate! Where to Buy Nut-Free & Gluten-Free Chanukah Chocolate! ChocolateGelt.com thinks everyone deserves a treat during Chanukah! That’s why Chocolategelt.com sell a wide variety of nut-free and gluten-free chanukah chocolates distributed by Party Judaica LLC. Which Chanukah Chocolates Are Truly Nut-Free? With food allergies ranging from mild to life-threatening, there is a massive difference between chocolate that’s merely nut-free – and chocolate produced in a completely nut-free factory. This ensures there are absolutely no trace amounts of nuts in your chocolate whatsoever. Luckily for chocolate lovers, Chanukah chocolate is available in gluten-free varieties from Party Judaica LLC. Chocolate by itself doesn’t typically include gluten, but certain candy bars and wafers may contain trace amounts – so it’s always good to find out for sure! People follow gluten-free diets for many reasons, though the main ones are celiac disease and wheat allergies. (Along with nuts, wheat is among one of the top eight FDA-recognized food allergens.) Other people choose not to consume gluten because of an adverse effect on their health, such as insulin spikes, low nutritional value, or negative effects on their digestive system. 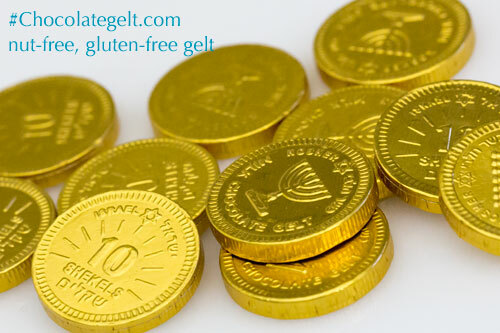 If you need nut-free Chanukah chocolate for your students or children, be sure to browse ChocolateGelt.com. Many case sizes are available, so you can ensure everyone at your party gets their own gift bag. You even get a free gift with every order! For any questions We’re always happy to hear from our customers. Hoping you have a fantastic Chanukah! Currently viewing:We Have Nut-Free & Gluten-Free Chanukah Chocolate!